Thank You Letter | Child Rescue Foundation, Inc.
As we turn the corner in 2012, we have made the decision to close our not for profit section of CRF and open a for profit arena, The Child Rescue Foundation Clearinghouse. We will be providing the same services and programs, including the Teddy bear Project and the Pencil Bear Project, while maintaining the ability to serve the over 15,000 children annually with goods that are supplied through the Children’;s Outreach Project Project. Many in the non profit sector have been experiencing a major downturn in donations and financial contributions for the 2012 fiscal year. It is a direct result of our struggling economy. While we all are struggling with issues of solvency, we are not seeing our client numbers decreasing- in fact, we have experienced a 26% increase over last year. This organization has always operated lean and mean, and will continue to do so. We will be looking at ways to further cut back spending, increase donor bases, and reach out to new potential grantors and financial supporters. 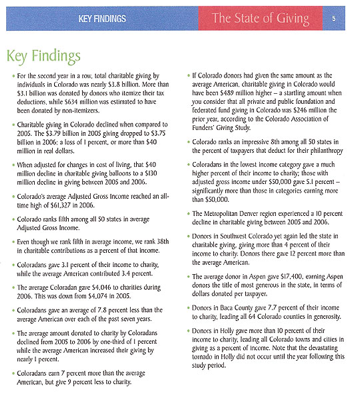 I am enclosing a few articles from the December Colorado Non Profit Association on philanthropy in the 2009-2010 era for you to read. 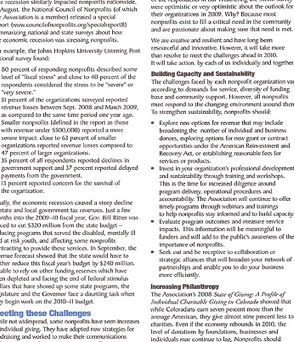 It is indeed interesting to see how our economic times have such a major trickle down impact on the non profit sector. I believe in CRF and what we do and we as an organization and a Board are committed to working through these hard times and using our creativity and passion, as well as compassion for the clients we serve, to make sure no child has to experience the devastating effects of violence or transition again.The curret board will be working as an Advisory Board form here on out and assting me with decisions on fiocnail aid as well as donations and donors. Joanne Kappel, Founding Director, has worked in the not-for-profit sector for the past 13 years, and has assisted over 500 clients of stalking in their recovery. Ms. Kappel developed her commitment to assisting others through their crisis of domestic violence stemming from her personal experience as a victim. She was stalked for three years, both physically and through the court system. A dedicated mother and single parent, Joanne has been a commercial photographer for 36 years. Ms. Kappel, has been an effective neighborhood activist who has sought to improve security and enhance property values in her Denver community. Not afraid to enlist her support in the toughest and most provocative of issues, Kappel resisted the lobbying of another liquor establishment in her neighborhood, by coordinating residents, government officials and the media to rally against the liquor store. Kappel, an advocate for others, became a mentor to criminal youth offenders at the Colorado State Correctional Facility in Golden, CO. There, she worked with young adults and children through her self-help “Positive Choices” program. The program promoted personal responsibility to offenders who were convinced the only attention they were worthy of receiving was the attention they received from crime and incarceration. CRF and the Board of Directors are actively involved as governing Board member of the Denver Domestic Violence Task Force and participate in VPEC (Violence Education Prevention), COVA, CCADV and CWWDV Committees. CRF also participates with DDVTF in the “Event to Prevent”, an effort to raise the awareness of violence on our children, with the help of the Rapids and the Broncos. This year, CRF’s mission is to complete the 11th Annual Teddy Bear Project ™ . The TBP is a event for the community to participate in raising funds and teddy bears for distribution by CRF, Inc. to advocates, crisis workers, police and firefighters, who often comfort children in tragic and lonely situations. In addition to elevating the financial status of the organization to better assist children and families, CRF will be working with faith organizations, corporations and community groups interested in impacting the immediate needs of children in crisis. Other programs include: the COP Project ™ (Children’s Outreach Project™) servicing daily needs of children in crisis, Case Management Project ™- working with victims on case by case assessment and planning for safety, TACT classes for self defense and the Pencil Box Project™, serving over 900 homeless youth with school supplies. In addition, the Colorado Drug Endangered Children’s Program provides children impacted by drugs with a new beginning. CRF, Inc.’s mission is to continue education and awareness of the crisis of domestic violence and to provide a voice for the children in family violence. CRF is a public speaker for this cause; working with children from elementary to middle school helping them make good choices in their life. The current trust fund, managed by LPL Financial, is for survivors of domestic violence and stalking who seek financial relief from an already stressful and overwhelming situation. Several key goals have been reached this year, including a workbook for victims of domestic violence and stalking, used by both adults and children in their recovery. The book “Paper Layers™”, is a pictorial in depth look CRF’s recovery process. A child’s book on domestic violence also has been released. The book called “It’s Not Okay to Hit,” is a learning tool for adults and children. The volunteers who make up the core of this organization have provided an ongoing support that has logged over 96,000 hours of service. Many of these volunteers come back year after year to become part of the CRF team. Thank you all for your compassion, support and wisdom in making this grassroots organization the success it has become. Please access the web site for any further information you may need on this timely organization.